Car Key Assist can provide professional Audi locksmith services in Birmingham and across the Midlands. 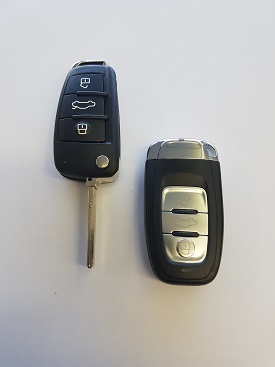 Supplying, cutting and programming Audi car keys and key remotes for a range of models, including A1, S1, A3, S3, A4, S4, A5, S5, A5, S6, A6 Allroad, RS6, Q5, Q7 and TT. Lost Your Audi Car Key and Need A Replacement or Spare? We can offer the most professional auto locksmith service available, using our unbeatable knowledge to provide reliable and fast car key cutting and car key programming. Our services are available 24 hours a day, 7 days a week, with an expert locksmith just a call away to help you with any Audi locksmith issue you may have. We can cut new keys, reprogramme key remotes, erase transponder codes from Audi keys and remove broken keys from locks and ignitions.